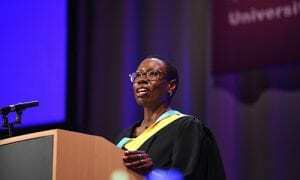 The top diversity officer with American Express has urged University of Brighton graduates to be fearless, ambitious – and to pace themselves. Sonia Cargan, who graduated from the University in 1991 with a BA(Hons) degree in social administration, was last year appointed Chief Diversity Officer for American Express. Sonia urged fearlessness and recounted her time in Asia when she would often find herself the only woman, the only person of colour, the only ‘Brit’: “Suddenly this amazing adventure became a little bit scary and I had to dig into not the bank of mum and dad but my resilience bank. “As you move on to your next chapters many of you will have fantastic options and opportunities and some of you will find yourselves in the position of being ‘the only’. And here’s what I want to say to you – your uniqueness is your greatest asset. Don’t let others define your limits, define them for yourselves. She said pacing was also important: “If you are going to have a positive impact on the world you are going to have to pace yourself. “For those of you who are runners you’ll know there are times when you go full speed ahead but there are also times when you slow down, catch your breath, take in the scene and just want to get to the end. Pacing yourself is about continuously recalibrating and adjusting when needed. It helps you focus and achieve your goals. “I, like you, had the privilege of attending this vibrant institution, the University of Brighton. My time here opened my mind to a world of options and opportunities that I could never have imagined.